Using stem cell and gene-editing techniques, researchers from Brigham and Women’s Hospital have succeeded in growing mini kidneys that mimic disease. These tiny, impressive organoids, just 1 mm in diameter, are capable of modeling healthy as well as diseased kidneys and contain kidney tubules resembling those in people. They can also survive after transplantation in mice. 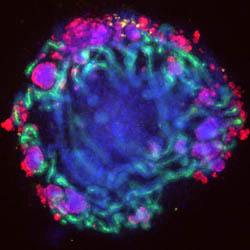 The researchers programmed the mini kidneys to re-create polycystic kidney disease and glomerulonephritis. This breakthrough in tissue engineering will allow scientists to better understand these diseases and find new therapeutic targets, test drugs, and develop treatments. It also paves the way for personalized transplant therapies using a patient’s own stem cells to create new kidney tissue. Get a behind-the-scenes look at this discovery in a fascinating article by the lead author of the study, Dr. Benjamin Freedman, now an Assistant Professor of Medicine at the University of Washington School of Medicine, Division of Nephrology and a member of the Kidney Research Institute and the Institute for Stem Cell and Regenerative Medicine. bioengineered kidney, stem cells. Bookmark.